Rolene Strauss, Miss South Africa 2014, a paragon of beauty meeting intelligence. The Palesa crown that is adorning Rolene’s head this year was designed and manufactured by Jack Friedman Jewellers from platinum mined and supplied by Anglo American Platinum. The Palesa Collection comes with a unique promise of beauty, rarity and fiery diamonds from responsible sourcing. Rolene also had a moment to the bespoke factory of Jack Friedman in Eastgate yesterday where she experienced the passion and precision of master craftsman at work and met up with the ladies that has made her dream of an extraodinary crown a reality. Jack Friedman was established in 1933 and is a third generation jeweler. A woman that receives a Jack Friedman design knows that she is truly loved and owns a treasure. The team at Jack Friedman Jewellers wanted something that was both elegant and memorable. They decided to make the crown from platinum, one of the rarest elements in the earth’s crust, and synonymous with South Africa which accounts for 80 percent of world production. The precious metal in the Miss SA 2014 crown comes from Anglo American Platinum. Inspiration was taken from the natural beauty of indigenous South African flowers and traditional patterns to create the new simple and striking crown. 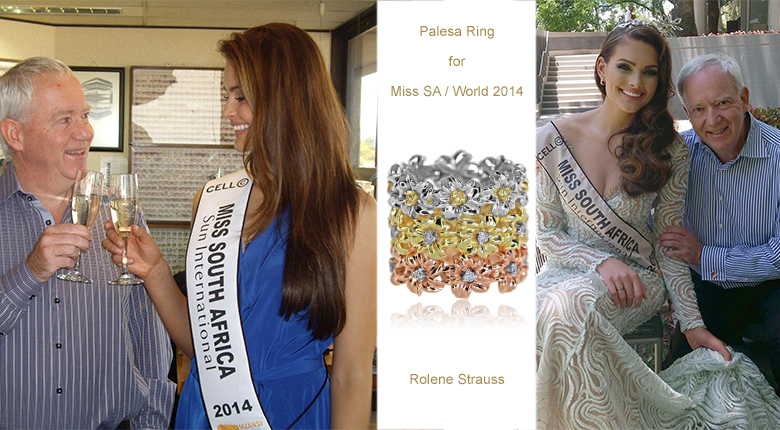 Palesa – flowers for SA’s most beautiful flower, Rolene Strauss.